Amsterdam (CNN) It takes less than a minute to walk from Amsterdam’s beautiful Portuguese Synagogue to the “De Dokwerker” statue. By the end of World War II, about 75% of the Dutch Jewish community had been wiped out. At a time when anti-Semitism is on the rise in Europe, the vandalizing of the “De Dokwerker” statue last week caused headlines both inside and outside the country. 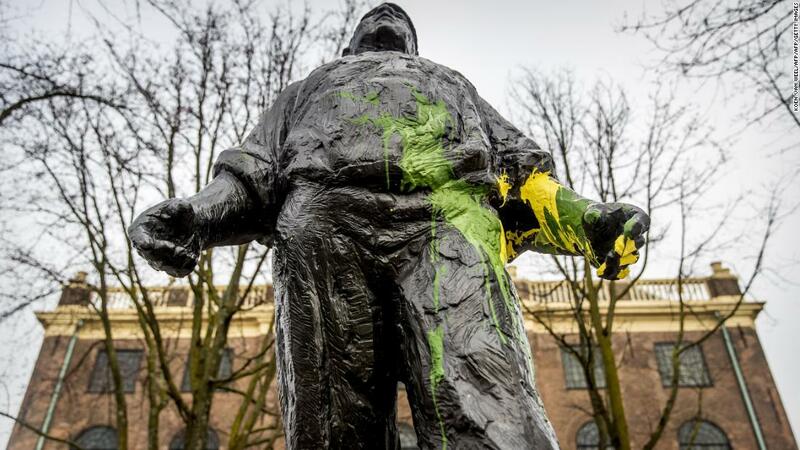 But the nature of the vandalism, the green and yellow paint on the statue, and the painting of green swastikas on the street, suggested a blurring of the lines between anti-Semitism, and hatred of the city’s football club, Ajax. 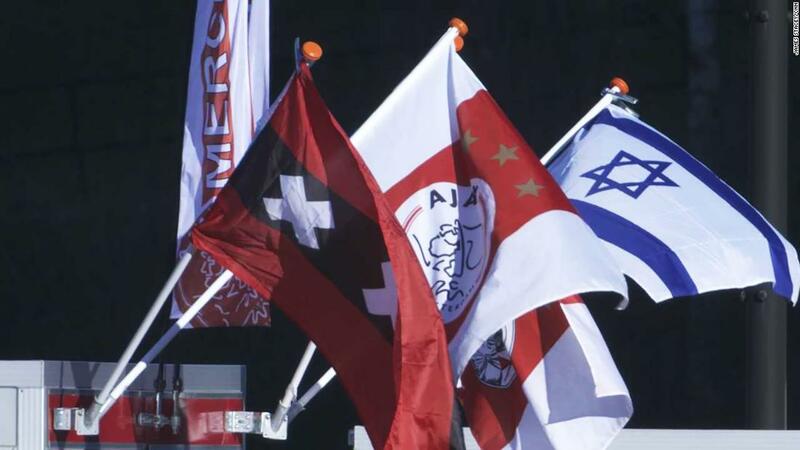 Throughout the Netherlands, and much of Europe, Ajax is known as a “Jewish club.” The vandalism, allegedly carried out by supporters of a rival football club in the Hague, shone a light on the complicated and often uneasy relationship between Ajax, the Jewish community and the anti-Semitism that it often attracts. ADO Den Haag, issued a statement in which it apologized for the graffiti. Amsterdam was once a bustling center of Jewish life, home to the Sephardi community who arrived from Iberia in the 16th century, and to an Ashkenazi community who fled from Poland. Before the Nazi invasion of the Netherlands in 1940, an estimated 80,000 of the country’s 140,000 Jews lived in Amsterdam. Some of the chairmen who led the club during the 60s and 70s were Jewish, while it also had Jewish players such as Bennie Muller and Sjaak Swaart. The club’s Jewish links often led to anti-Semitic abuse from rival supporters. To counter that, a section of fans began to fight back by calling themselves “Super Jews,” adopting the Israeli flag as a symbol and wearing the Star of David. 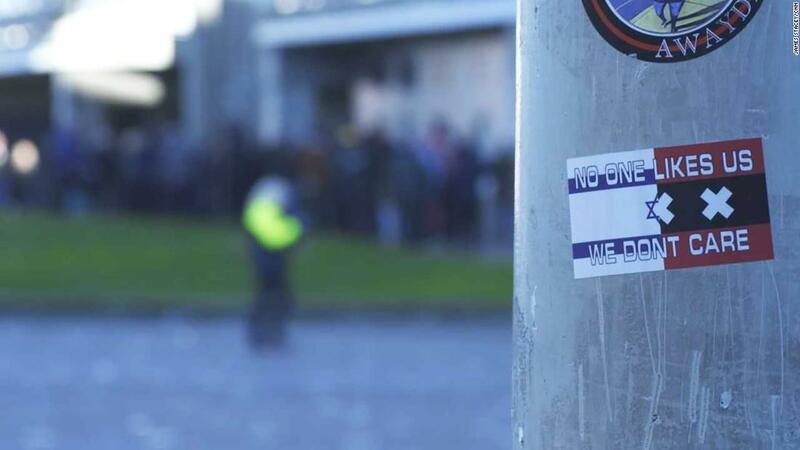 Like those who follow English club Tottenham Hotspur, this was seen as a response toward rival fans who used anti-Semitism to attack the Ajax support. 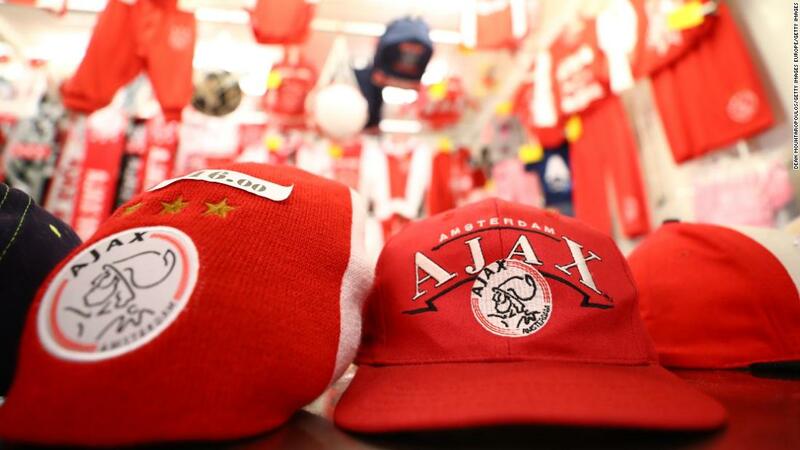 “I don’t like it,” David Endt, Ajax’s general manager between 1997 and 2013, told CNN. “It gives the other party an alibi, to shout wrong things about it, to hurt people who have nothing to do with football. Endt, who is Jewish, also says the club itself must do more to tackle the problem, making education a key part of the solution. “I think the club should do more,” he said. 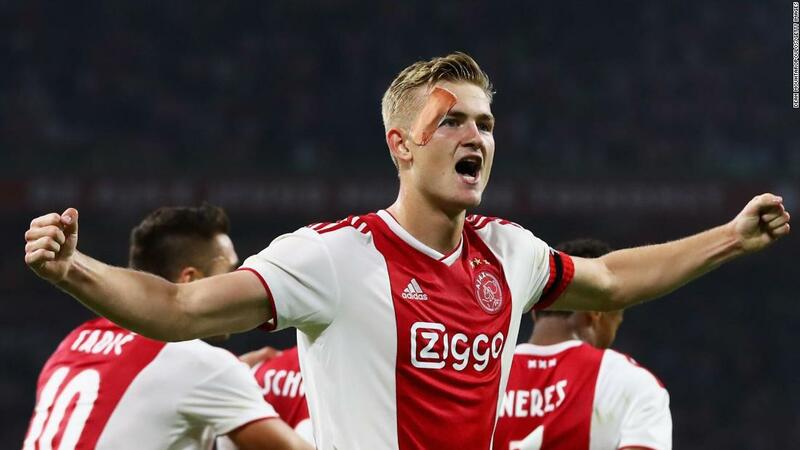 “You know, maybe with the younger kids, teach them the meaning of the, the Jewish flag, which has nothing to do with Ajax. Ajax told CNN it did not want to comment. READ: Has the world learned the lessons of the Holocaust? I don’t think so. 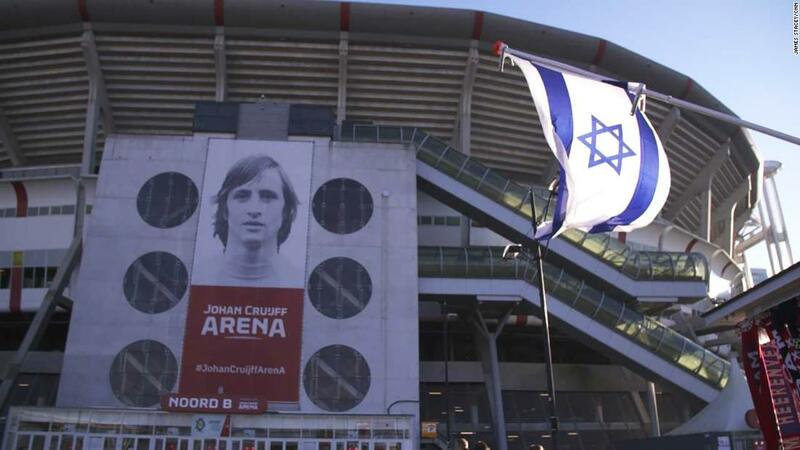 Speaking to CNN, a number of Ajax supporters who refused to give their names, insisted the use of Jewish symbolism had nothing to do with religion. Off the field, the Dutch football authorities have made the eradication of anti-Semitism a priority. 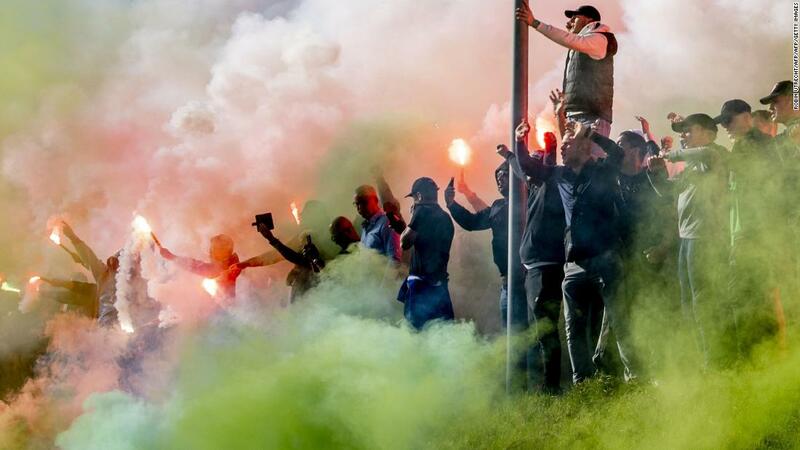 Since 2016 the KNVB, the governing body of Dutch football, has met with Jewish groups to discuss tackling anti-Semitic chanting. Last year the body set up a working group along with a number of social interest groups to tackle discrimination as a whole. Sanctions have been upgraded with clubs handed higher fines, partial stadium closures and individuals banned for up to five years for anti-Semitic chanting. In addition, an education program has been set up to tackle racism and anti-Semitism in football. The link between Ajax, the Jewish community and anti-Semitism remains a highly divisive issue. Even now, near the stadium, Israeli flags can be seen in local shops. Around 140,000 Jews, including 15,000 who had fled Germany, were living in the country when it was invaded by the Nazis in May 1940, according to Yad Vashem, the Holocaust memorial museum in Jerusalem. It didn’t take long for anti-Semitic laws to be enacted and deportations to death camps to start. Many were sent to Auschwitz and Sobibor via the transit camps of Westerbork or Vught. By the time the final transport left the Netherlands in September 1944, a total of 107,000 Jews had been deported to death camps, according to Yad Vashem. Over 75% of Dutch Jewry perished in the Holocaust, the Jerusalem-based museum estimates. No other country, except Poland which lost 90% of its Jews, lost as much of its Jewish community in the Holocaust. According to the Center for Information and Documentation on Israel (CIDI), anti-Semitic attacks increased by 40 percent in 2017, despite Jews making up less than 0.3% of the population in the Netherlands. Figures showed that 41% of 144 criminal offenses upheld by the country’s judiciary, including vandalism, assault and incitement to violence, were carried out against Jews. The figure has nearly doubled since 2016, where 22% of 163 cases were classified as anti-Semitic, according to the Dutch Public Prosecution Service. The results fit a growing trend both in the Netherlands and within Europe itself. According to a report published by the European Union in December 2018, 34% of Jewish people surveyed in Netherlands said they avoid visiting Jewish sites or events because they do not feel safe. 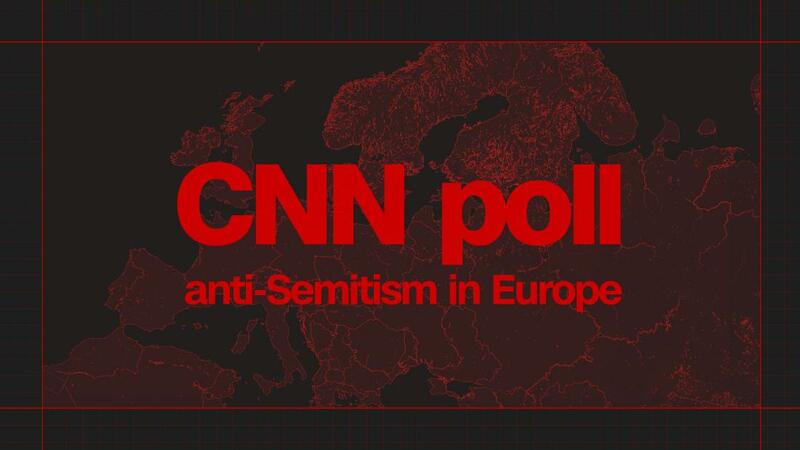 More than 16,000 people across 12 EU member states took part in the survey with around 90% of respondents saying they felt that antisemitism is growing in their country. “There used to be a very thin layer of veneer of civilization over the anti-Semitism,” Esther Voet, editor of Jewish weekly newspaper NIW, told CNN. The advent of social media has led to many anti-Semitic incidents at football stadiums being shared online. 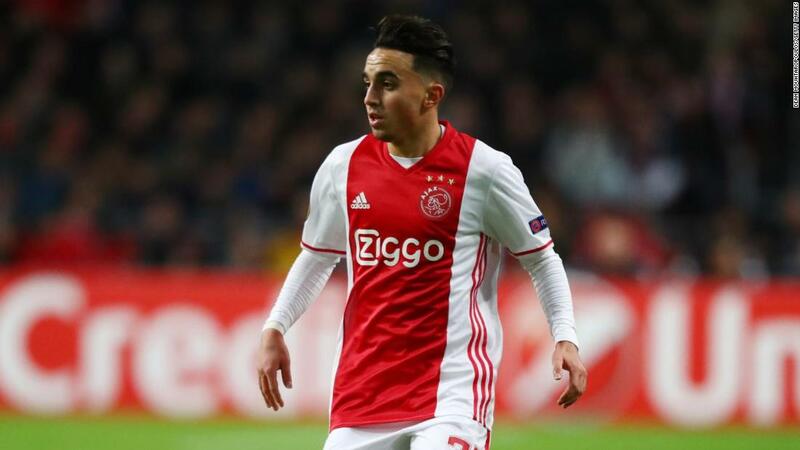 The incident took place in Rotterdam ahead of the game with Ajax on January 29 — International Holocaust Remembrance Day. Other instances within Dutch football include Feyenoord fans taunting Ajax about Holocaust victims and AZ Alkmaar supporters chanting: “Hamas, Hamas, Jews to the gas,” during a fixture in December 2017. Chants such as “Let’s go Jew hunting” and “If you don’t jump, you’re a Jew,” can also be heard from rival fans. 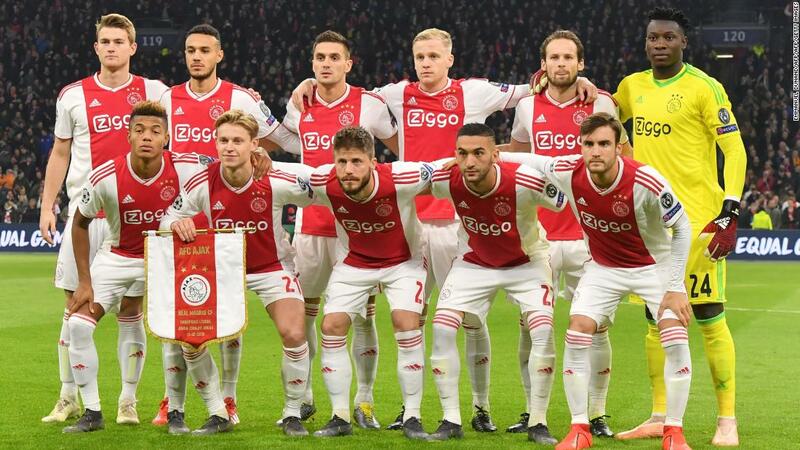 Its director, Nirit Peled, who moved to Amsterdam from Tel Aviv, at the age of 22, recalls being on a tram with Ajax supporters waving Israeli flags and singing about being Jewish. Initially disturbed by what she had seen, curiosity began to get the better of her. “I think it’s something that is taken out of context. They’re definitely taking a side and then the other one takes another side, and I can tell you for a fact that the Rotterdam supporters do not identify with the Palestinian cause,” she said. 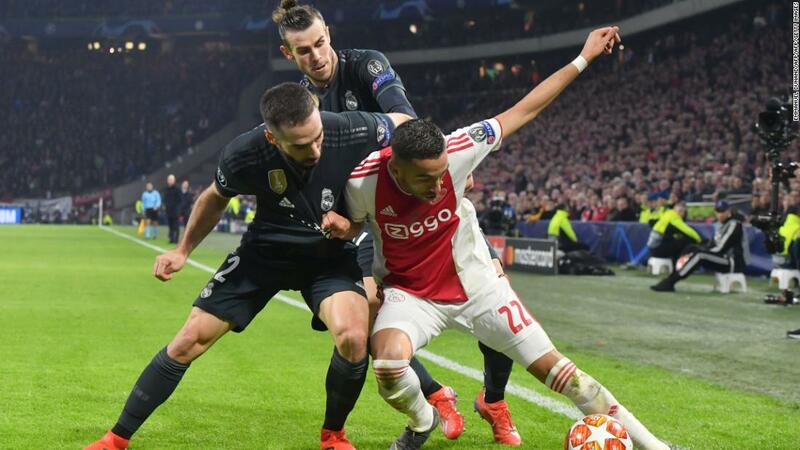 Peled believes that there is little animosity meant by the Ajax supporters, stressing that some of them may not even be aware of the connotations of their chants. “They don’t even know that it’s actually the Star of David. Today, it’s the Ajax star.